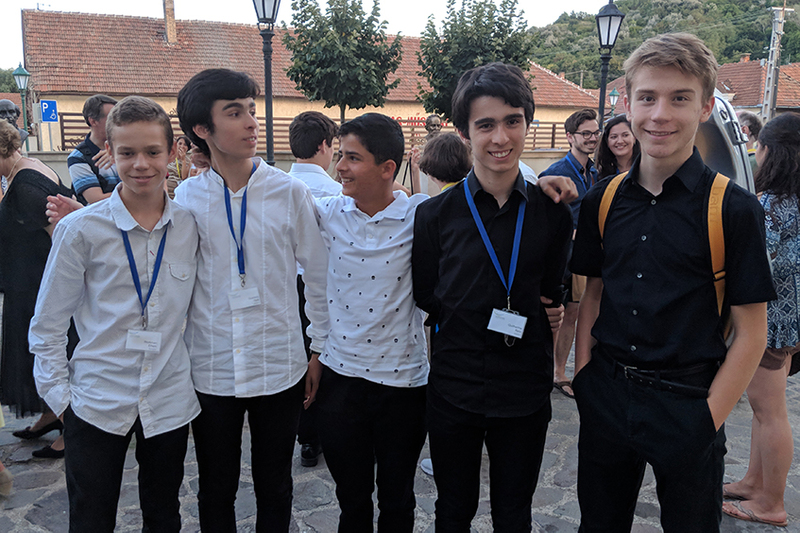 One of the most exciting moments of the summer was late one night in the dorm in Tokaj Hungary during the Crescendo Summer Institute. I heard voices in the hallway outside our room. Silas and Efrem were talking with two students from Portugal about their faith in Christ. The boys were part of the youth discussion group May and I were leading, where they asked lots of questions clearly expressing their agnosticism. They really wanted to know why we believe in God. Silas and Efrem's enthusiasm for this open discussion of faith was evident. They were experiencing the thrill of sharing Christ! Later, they beamed when recounting their conversation. The theme for the morning devotionals, and our discussion group, was happiness. We explored, "What do you need to be happy?" as well as considering the importance of close relationships and the joy knowing God brings. Our group had young students from nine different countries. For us, being at Crescendo again was amazing, enveloped in music and the Christian love that permeates the institute. There were so many concerts! Once again, Silas and Efrem participated, having frequent opportunities to perform, solo, in ensembles, and even Beethoven's 3rd symphony. One more thrilling moment was watching Efrem nail the piece he played at the final gala concert (Nocturne et Allegro Scherzando by Gaubert). He had the privilege of being chosen out of 15 flutists to play. Click to learn more about Crescendo. 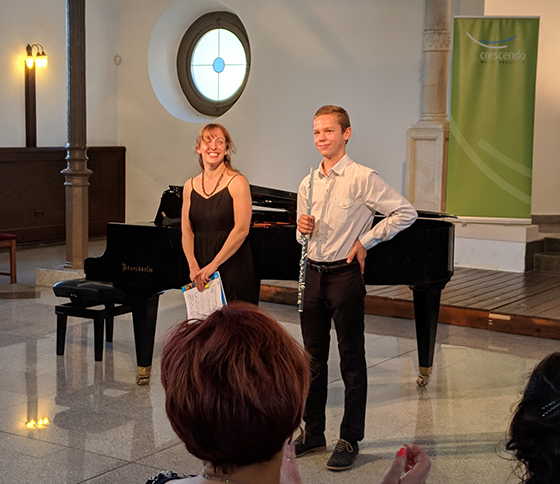 Efrem takes a bow at the gala concert. On the Santiago Bridge connecting France and Spain. for wisdom as May leads the technology team, prioritizing what's most important. 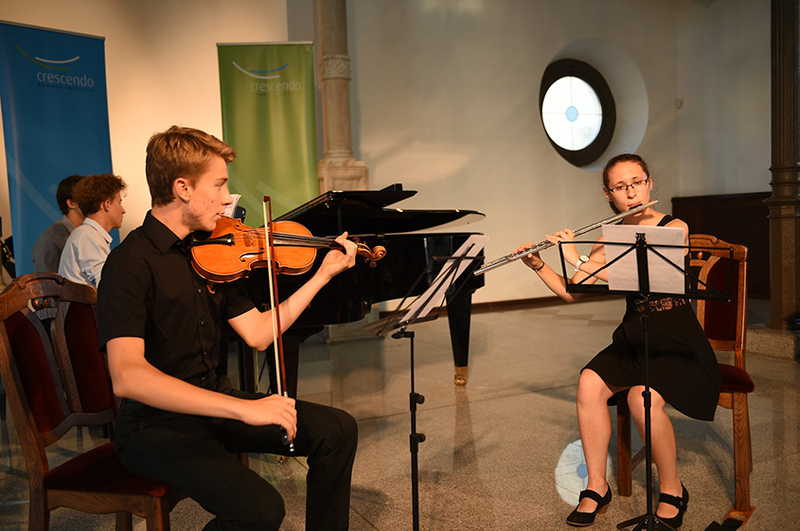 that Silas and Efrem (senior and freshman) would have successful studies in school and at the conservatory. for good progress and learning as Dan works to finish the "Connecting" animated video. We were home only a few days (to catch up on laundry) before we left on our family's fifth biking/camping adventure. We continued following the same trail where we left off two years ago. 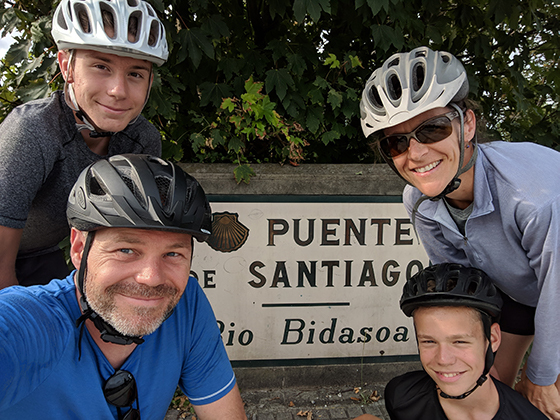 This time we made it all the way to Spain, crossing the Santiago Bridge! The final leg covered 126 miles of the south-western coast. 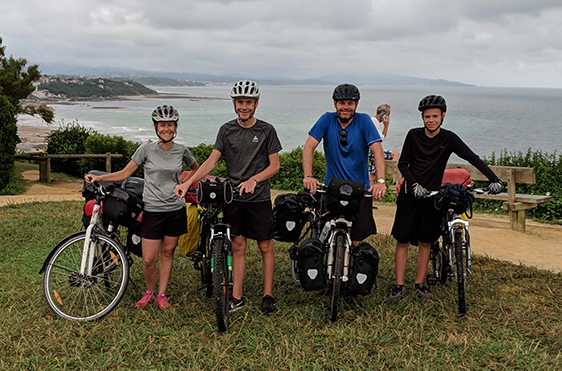 We passed through Bayonne and Biarritz, taking in the Basque culture. This area is also known for its waves, which Silas and Efrem notably love to body-surf. The boys also were put in charge of cooking with the camping stove, another good skill to develop. Our bikes, laden with saddle bags, had zero problems. Their riders, on the other hand, sometimes had to climb off and push them up the hills as we got closer to the border and the mountains. How do you feel about family reunions? What if there were over a thousand people? Cru held a conference for all Western European staff members in July. It was called the Agapé family gathering. The last one was six years ago in Tallinn Estonia. This time it was hosted and organized by the Swiss, and it went like clockwork. We arrived at the campus in Sursee Switzerland and saw an enormous meeting tent with stage, lights, screens, and fans. Everywhere we went there were people we knew, colleagues from our time in Kandern and campus and IT people. What a blessing it was to share a smile and catch up with so many dear friends. The purpose of such a gathering is to reconnect, hear what God is doing all across the continent, and look forward to what he’s calling us to in coming years. The stories told were inspiring, and the vision shared was ambitious. In typical Cru fashion we are expectant that God will do big things! With a sea of staff serving in more than twenty countries, it brought to life the image from Revelation 7 of the great multitude from every nation, all tribes, peoples and languages worshiping Christ. During this time, Silas and Efrem participated in the Shine program. About 300 youth had their own program and worship which culminated in two outreaches in the community. It’s such a joy to hear your sons enthusiasm for sharing the gospel! They camped out in a classroom using sleeping bags with a large contingent of guys from Spain, the Netherlands and England, a microcosm of interesting cultural differences. At the end of the week they were utterly exhausted. We’ve never seen them fall asleep so quickly and easily! The Agapé Europe family gathering. Many Swiss houses are brightly decorated or have painted murals. 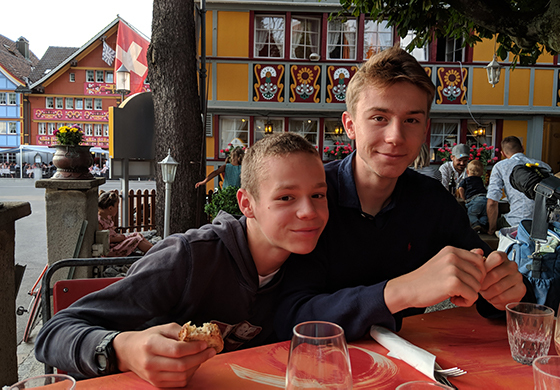 This was taken in Appenzell. for us representing digital ministries at the upcoming kick-off conference for campus ministry. that the construction of the new French giving site would go smoothly and rapidly. for Silas as he prepares to take the SAT and looks into applying for colleges. 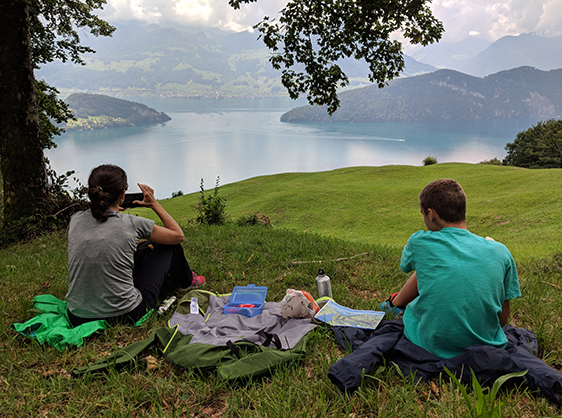 A picturesque picnic spot in Switzerland. Efrem hand assembling his own Swiss army knife. 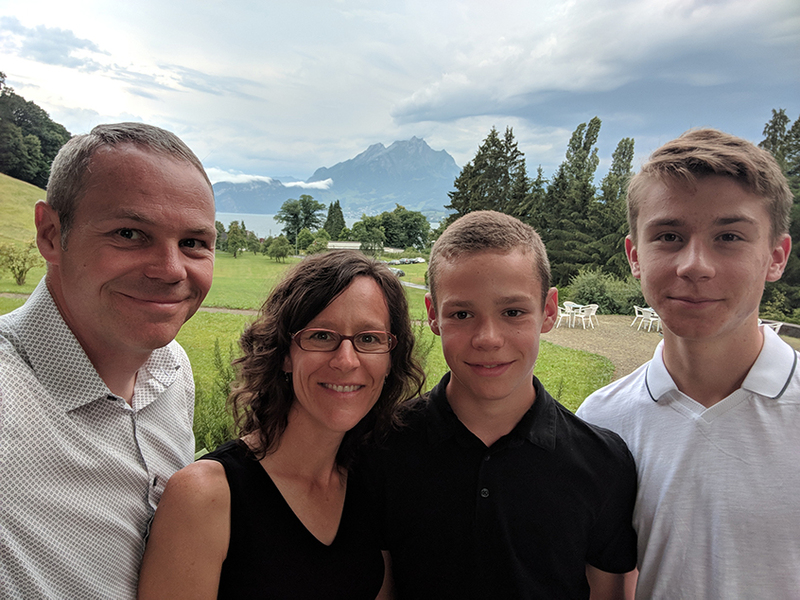 Since we needed to be in Switzerland for the conference, we decided to take some vacation there beforehand. This involved visiting towns with fairy-tale buildings and hiking beautiful mountains. There really are cows grazing the mountain pastures with big bells around their necks, and we loved the swiss cheese. 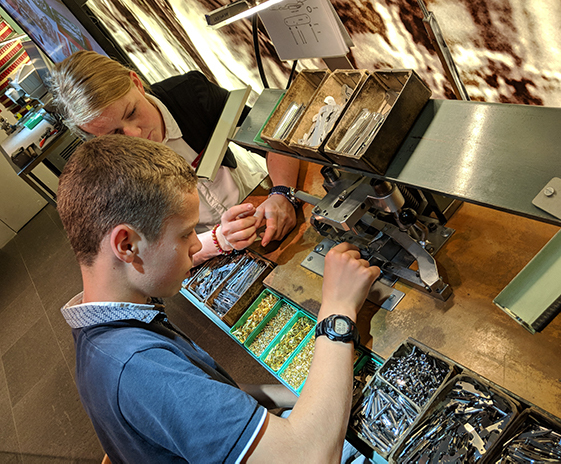 One lasting memory will be the boys hand assembling their own swiss army knives. They step you through the process of assembling the knife at an actual factory table. Then they engrave it with whatever you'd like. The perfect swiss souvenir! Finally, May found out that the James Galway flute festival was starting the weekend before the conference just 30 miles away. We spent a few days there so that Efrem could attend some master classes. Every night one of the world renowned guest instructors gave a concert, and even Sir James himself played the opening night. It was a beautiful way to end our vacation time there.